Manis tricuspis, the African tree pangolin, is one of seven extant pangolins or scaly anteaters. Pangolins are unique looking mammals that are characterized by elongated bodies with long tails that are nearly completely covered by overlapping scales composed of agglutinated hair (Nowak, 1991). They have long claws on their forefeet for digging out ants and termites, their primary diet, and a long, sticky, vermiform tongue, which has its muscular attachment to the pelvis (Nowak, 1991). The placement of pangolins within the placental tree has long been debated. Phylogenetic analyses based on morphological data place pangolins as the sister taxon to xenarthrans (Novacek and Wyss, 1986; Novacek, 1992a, b). Some analyses based on a variety of molecular data have pangolins as the sister taxon to carnivorans (Murphy et al., 2001; Scally et al., 2001). Pangolins are native to most of mainland and insular Southeast Asia, China, Taiwan, Thailand, India, Sri Lanka, and parts of Africa (Nowak, 1991). Manis tricuspis is known from Africa only: Senegal to western Kenya, and south to Zambia (Nowak, 1991). The fossil record for pangolins includes taxa from the middle Eocene through Pliocene of Europe, the Pleistocene of Asia, the Plio-Pleistocene of South Africa, and a single taxon from the Oligocene of Wyoming (Emry, 1970; Heath, 1992). Manis tricuspis is the smallest extant pangolin (1.8 - 2.4 kg). It derives its name from the three points on its scales. Manis tricuspis inhabits African rainforests. It is nocturnal in activity and shelters in hollow trees and termite mounds. Pangolins may walk on their hind limbs or on all four limbs. The tail is prehensile. When using the forefeet to locomote, they walk on their knuckles with the claws curled underneath. Pangolins are known to curl into a tight ball for protection when startled (Nowak, 1991). The pangolin skull is characterized by a lack of teeth, lack of zygomatic arches, and an extremely reduced mandible. Each dentary has a single, dorsal, bony tooth-like protrusion. Pangolins are highly sought for food and for their skins and scales. The scales are used for medicinal purposes, particularly in Asian countries, and the skins are used to manufacture leather goods (Nowak, 1991). Consequently, three of the seven species of Manis are listed on appendix II of CITES. This specimen (AMNH 53896) was made available to the University of Texas High-Resolution X-ray CT Facility for scanning by Ted Macrini of the Department of Geological Sciences, The University of Texas at Austin. Funding for scanning was provided by a National Science Foundation Dissertation Improvement Grant (DEB-0309369) to Mr. Macrini. Funding for image processing was provided by a National Science Foundation Digital Libraries Initiative grant to Dr. Rowe. The specimen was scanned by Matthew Colbert on 27 October 2003 along the coronal axis for a total of 648 slices, each slice 0.116 mm thick with an interslice spacing of 0.116 mm. Emry, R. J. 1970. A North American Oligocene pangolin and other additions to the Pholidota. Bulletin of the American Museum of Natural History 142:456-510. Heath, M. E. 1992. Manis pentadactyla. Mammalian Species 414:1-6. Heath, M. E. 1992. Manis temminckii. Mammalian Species 415:1-5. Heath, M. E. 1995. Manis crassicaudata. Mammalian Species 513:1-4. Jollie, M. 1968. 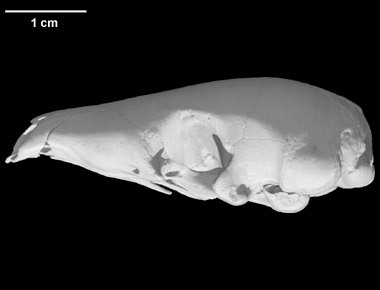 The head skeleton of the new-born Manis javanica with comments on the ontogeny and phylogeny of the mammal head skeleton. Acta Zoologica 49:227-305. Novacek, M. J., and A. R. Wyss. 1986. Higher-level relationships of the recent eutherian orders: morphological evidence. Cladistics 2:257-287. Scally, M., O. Madsen, C. J. Douady, W. W. de Jong, M. J. Stanhope, and M. S. Springer. 2001 (2002). Molecular evidence for the major clades of placental mammals. Journal of Mammalian Evolution 8:239-277. Click on the thumbnail to the left for a pitch animation (1.9 mb) of the Manis cranial endocast highlighted in red within the skull, which is rendered semi-transparent. Click on the thumbnail to the left for a pitch animation (1.3 mb) of the isolated Manis cranial endocast. Click on the thumbnail to the left for a roll animation (2.3 mb) of the Manis cranial endocast highlighted in red within the skull, which is rendered semi-transparent. Click on the thumbnail to the left for a roll animation (2.1 mb) of the isolated Manis cranial endocast. To cite this page: Dr. Ted Macrini, 2004, "Manis tricuspis" (On-line), Digital Morphology. Accessed April 25, 2019 at http://digimorph.org/specimens/Manis_tricuspis/skull/.